Colevin Interiors are supporting the Princess Alice Hospice. 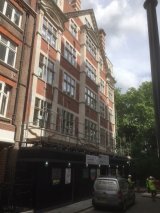 Works, which will extend over a period of 22 weeks, include demolition, extension of Lift pit, renewal of roof coverings, replacement of windows and curtain walling, new reception & WC areas, replacement of canopy, new MEPH services throughout, floors and ceilings throughout and internal and external repairs. 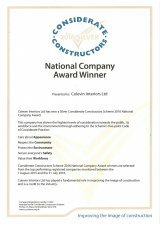 We were delighted to be informed that we had won a Silver Award as one of the highest scoring companies of all those registered with the Considerate Constructors Scheme for 2016.
the client’s/architect’s scheme was an upgrade of the main working floors together with the introduction of dedicated meeting room suites, break-out areas and executive toilets. External works included a large open terrace with timber planting and seating areas. 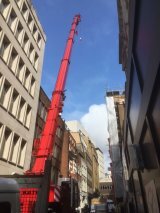 The KATO MR-350 Ri super lifter which was used on the Watergate House site to lift airconditioning/airhandling units on to the roof of the building. This is the first time this piece of equipment has been used in the UK, what a beast! Colevin Interiors are proud to sponsor Crystal Palace FC midfielder and DR Congo international Yannick Bolasie. Refurbishment, remodelling and improvements to the existing building, including fitting to CAT A standard. The Edwardian building is on the site of York House which the 1st Duke of Buckingham George Villiers had acquired from the Archbishop of York in 1624 but was subsequently demolished in 1675. Nearby in Embankment Gardens is the York Watergate which marks the position of the north bank of the Thames before the construction of Victoria Embankment in 1862. Our site at Watergate House is actively supporting Julia’s House, the only children’s hospice charity in Dorset dedicated to helping life-limited children and their families across the county and in South Wiltshire as we feel it’s important to give something back particularly in times of economic downturn. Following recent base build, CAT B fitout to the 9th floor including flooring, movable acoustic walls, bespoke joinery, signage, tea point. 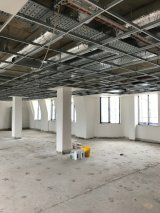 Soft strip out of all ceilings, partitions, floor coverings, fixtures and fittings and WCs. Builders’ works include remodelling to the basement, ground floor reception and WCs with enlargement of office floor door openings together with fit out of office ceilings, walls and floors. M & E installations consist of a new chiller, boilers, pumps, lighting and potential to overhaul or replace fan coil units. Ebiquity is an international provider of media and marketing analytics. Works to the 8th floor include fabric, electrical and mechanical alteration and installation. Wood Mackenzie provide research and consulting services for the global energy, mining, metal, oil, gas, coal, refining, power and electricity industries. Works include formation of open plan office accommodation. Beach Point Capital Management is a multi-billion dollar investment manager specializing in credit-related investments. The scheme includes formation of high spec offices and meeting rooms.